MOLECUBES build preclinical imaging CUBES allowing researchers to perform high-performance SPECT/CT and PET/CT studies without complex system handling and with very limited lab space requirements. With MOLECUBES CUBES whole-body mice and rats are imaged while modularity accounts for the evolution of lab needs. 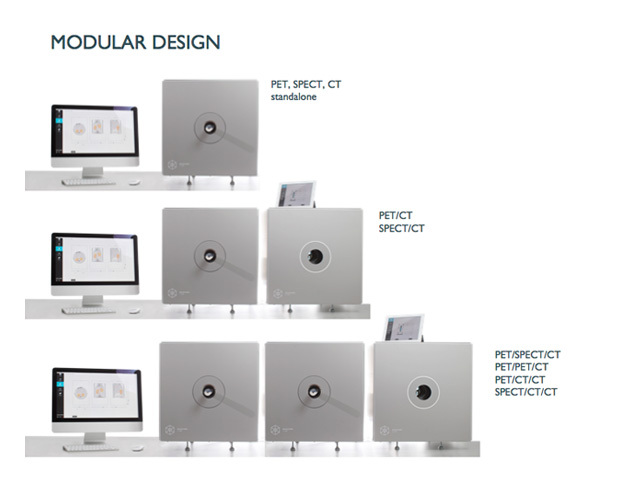 MOLECUBES provide in-house developed small-animal beds that monitor the animal’s vital parameters and are compatible with standard preclinical MRI-systems. MOLECUBES assure you different datasets are coregistered automagically through in-house coregistration. Once acquired, reconstructed and fused, image data are compatible with most common image analysis packages available in the market. Our Best Uptime Service model guarantees that we will swap any defect system within 3 business days, assuring as little downtime as possible. All systems are also continuously monitored remotely. In-house developed graphical user interfacing as well as a standard set of protocols allow for expert as well as non-expert users to start using any CUBE with minimal training. Our rat and mouse beds are compatible with all CUBES and provide heating, anaesthesia and ECG-monitoring. Tail vein injections while scanning are made easy through an accompanying docking station. All cubes are 54x54x54 cm3 in surface and weigh anywhere between 80-100 kgs. They need no external hardware or software and are (trans)portable from one lab room to the other. Start with any cube you desire and add one when you need it. If high troughput is what you are after, multiple CUBES from any modality can be stacked or used side-by-side or in a modular mode. All CUBES use statistical iterative reconstruction techniques. We exclusively reconstruct on GPUs, so your reconstructions are only minutes away. This leaves you time to focus on what matters: quantitative data analysis.